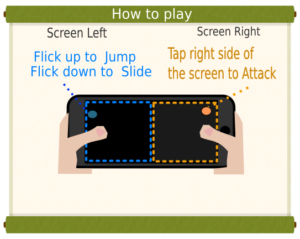 A new game for an android phone made for Karate geeks by a Karate geek! A fun runner style game that can keep you addicted for a long time! Old school style 2D runner game! You will be running through hordes of enemies and traps and the main purpose of this game is to live as long as possible. Gain a higher score to obtain a Dan rank! There will be a ranking system embedded in the app, therefore, you can compare the score with your friends! There are 2 modes, normal and hard. For those who find normal mode easy, try out the hard mode and see how long you can survive! We will be adding more stages and difficulty level in the near future so look forward to it! You can select a colourful or a sepia old fashioned UI from the Options! What benefit does it do? It’s just cool! How to play? Easy isn’t it?